As September approaches we are seeing the first hints of fall, and the corresponding change in the garden and in things to be done on the farm. New crops this week for shareholders are the very first of our okra and some more eggplant, optional to take for those who like it. 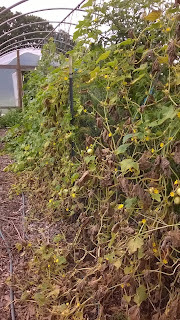 In the greenhouse the lemon cucumbers are succumbing to downy mildew, the leaves turning yellow then sandpapery and brown, then shriveling up. The greenhouse tomatoes are slowing down, and the first hints of powdery mildew are appearing up on summer squash, signaling the coming end to those crops. Field tomatoes are coming in to full swing though, and the corn is getting close. We can spot orange pumpkins in the field, and fall apricots and pears will be ready in a few weeks. Soon we will need to start hauling and storing firewood for winter. Fall butchering is also approaching, for our old layer hens and our lambs. The piglets were born later, so we will keep them up until the beginning of deer season, before the processor's get flooded with deer business. We still have one lamb and 1 and 1/2 hogs available, for those looking to source their meat locally. Buffy's piglets are due in the next two weeks, but we're taking reservations now for those who are interested. 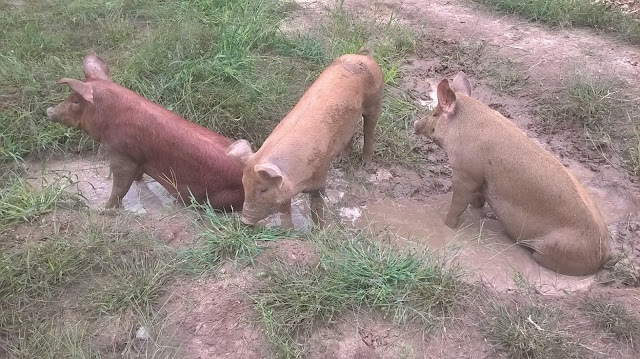 We've had some trouble with the piglets respecting the electric fencing this year, which underlined the importance of training them on it early and having a consistent charge--we were having issues with old batteries losing their charge on our solar powered electric fence chargers. As much as we love these chargers, the batteries have to be replaced about every year. 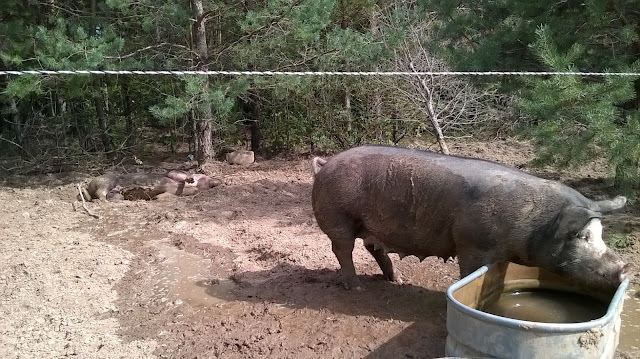 So we purchased an AC powered charger and have been retraining the piglets to that fence, but have had issues with the ground rods and not getting the charge through. After trying and replacing everything we could think of, we decided to shift the 8' ground rods, and found that the first ground rod was in soil too sandy and too dry. Piglets are now respecting the fence again, and these farmers are breathing easy again. In other news on the farm, we are looking to sell our Dorset ram Henry and our Texel/Polypay ewe Emma. 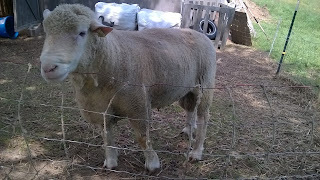 While we've liked some parts of our experiment with sheep--less mowing and wool, we've had too many issues with escapes from the portable electric fencing that has taken time away from other things on the farm. We've concluded that if we want to do sheep we would need permanent pasture fencing. And because we prefer rotational grazing, this would be a lot of fencing, which we are not ready to make that kind of investment in. We've already found a home for Simone this Monday, and are now looking for a home for Henry and Emma. Both are young, Henry 5 and papered, Emma 4. Emma has always thrown twos or threes, with no problems as assistance necessary. If interested, contact us to come take a look at them. Large Share pictured: 2 heirloom slicing tomatoes, 8 red paste tomatoes, 4 long green cucumbers, 4 lemon cucumbers, 1 eggplant (optional), 1 okra, 4 lbs green beans, 2 bunches kale, 6 summer squash, 2 yellow onions, 2 banana peppers, 8 jalapeño peppers, 4 bell peppers, 2 cubanelle peppers, 2 lbs tomatillos, 2 bunches herbs. New this week is the first of the Okra, so only one for each shareholder. We like to use our Okra by slicing it and dicing a jalapeno and adding that to a cornbread recipe. Okra can also be grilled, sauteed, fried, stir-fried, or added to soup. More lemon and long green cucumbers this week. The lemon cucumbers are succumbing to downy mildew, so likely next week will be our last week of lemon cucumbers, hope you all enjoyed them while we had them! Resembling a lemon, these cucumbers originated in the Middle East and have a mild pleasant taste complemented by a cool, crisp texture. The flavor is more delicately sweet and less acidic than the common green cucumber. The tiny bristles are edible but may be easily removed. These are both dual purpose cucumbers, great for enjoying fresh or pickling. Try adding them to a sandwich, wrap, or pasta salad or making a cucumber salad. The greenhouse tomatoes are slowing down, but just as our field tomatoes are kicking in. We have a different heirloom tomato slicer this week, one that was given to us by another farmer and so we can't remember the variety's name. Also lots of red paste tomatoes for bruschetta or salsa or caprese salad this week! Cubanelle, jalapeño, banana and bell peppers this week! Enjoy some fresh salsa with this mix of hot and sweet peppers. Some smaller yellow onions from the field for your salsa this week. Try these sautéed or grilled with our carbonara recipe or in a cooling summer pasta salad. The larger zucchini are great shredded and then made into muffins or bread. More green beans this week, enough to preserve some for the winter, and we'll have more available at pickup for those looking to put away more. The yellow beans are yellow throughout, and will keep their color when cooked, the purple beans however are only purple on the exterior and will change to green when cooked. For herbs this week we have Italian Basil, onion chives and orange mint. Italian basil goes well with tomatoes, summer squash, cubanelle peppers, chicken, beef, and fish. Try it in caprese salad or the mothership tomato salad! This is an heirloom variety called Lettuce Leaf because its leaves are that large. Onion Chives have a mild onion flavor and pair well with potatoes, chicken, fish, eggs, in dips, soups, sauces, risottos and rice. Orange mint can be added to water or juice and left for 10 + minutes to infuse their flavor, or they can be dried and made into a tea, or used as a mint in any cooking recipe that calls for them, goes well with eggplant, tomatoes, and zucchini. 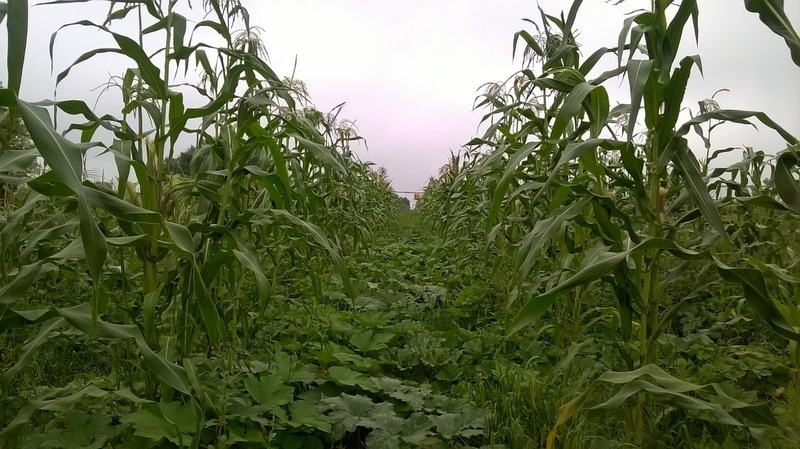 More rain this week on the farm, and the plants are soaking it up, the corn tasseling and tomatoes ripening. 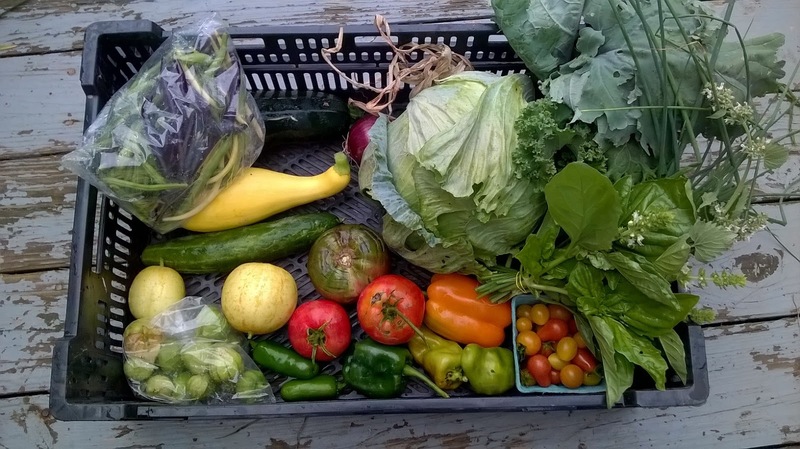 New this week from the garden are the first cabbage of the season, the first purple and yellow beans, and a return of more kale. In the garden Farmer Figgins has been focusing on clearing aisles and mulching with a thick later of wood chips. Meanwhile, in the greenhouse, tomato hornworms and squash beetles are making their presence known, and taking a few plants down with them. Neem oil can help with the squash beetles, but tomato hornworms have to be manually squashed, and there are always new ones appearing. Luckily the tomatoes in the garden are just starting to ripen as the tomato hornworms do their most damage in the greenhouse, taking bites out of green and ripening fruit alike and stripping the tomato vine of all its foliage and fruit. Out on the pasture the sheep and cow are keeping cool and enjoying the regrowth of grass since the last cutting and after the new influx of rain. The chickens have been free ranging and helping peck through and spread our cow Rosie's manure on her pasture. We have a few too many old hens though, and we'd like to put 10-20 in our freezer this fall. If anyone is interested in joining us this fall for a chicken processing date, lending a hand or learning the process from us, we'd be happy to have you! One of our sows, Buffy (right), will be due with piglets in early September. She's just starting to show some udder growth and filling in. We'll be separating her from the rest of the pigs soon, with a hut to give shelter when she farrows. All of her piglets will be for sale, after 5 weeks old minimum. We prefer to raise pigs for meat seasonally, but these piglets would need to be finished inside. Our other sow, Cordelia, has not been cooperative in having her tested for standing heat, so we may be considering having her go with a boar in the late fall. We do still have Pasture Raised Pigs for sale for your freezer for this fall/winter, contact us if you are interested in getting some Shire Farm pork for your freezer. 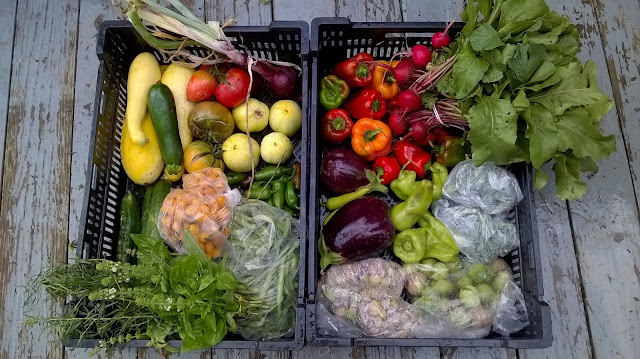 Large Share pictured: 2 bunches kale, 2 heads cabbage, 4 lemon cucumbers, 2 long green cucumbers, 4 summer squash, 2 herb bundles, 2 bell peppers, 2 poblano peppers, 2 red onions, 4 jalapeños, 4 cubanelle peppers, 1 lb tomatillos, 2 lbs green beans, 2 slicer tomatoes, 4 red tomatoes, 2 cartons of snacking tomatoes. 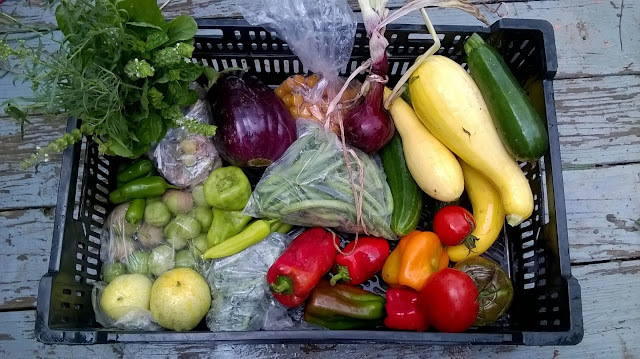 Small Share pictured: 1 lb green beans, 2 summer squash, 1 long green cucumber, 2 lemon cucumbers, 1 red onion, 1 slicer tomato, 2 red tomatoes, 1 carton snacking tomatoes, 1 bell pepper, 2 cubanelle peppers, 2 jalapeños, 1 poblano, .5 lb tomatillo, 1 head cabbage, 1 bunch kale, 1 bunch herbs. 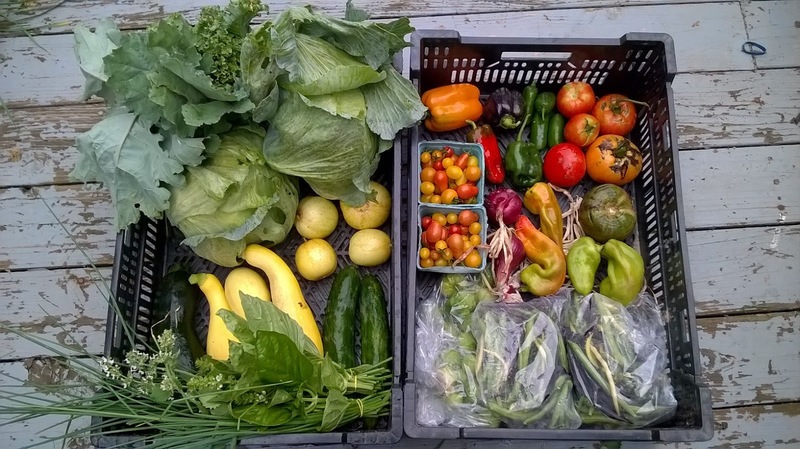 More lemon and long green cucumbers this week. Resembling a lemon, these cucumbers originated in the Middle East and have a mild pleasant taste complemented by a cool, crisp texture. The flavor is more delicately sweet and less acidic than the common green cucumber. The time bristles are edible but may be easily removed. These are dual purpose cucumbers, great for enjoying fresh or pickling. Try adding them to a sandwich, wrap, or pasta salad or making a cucumber salad. 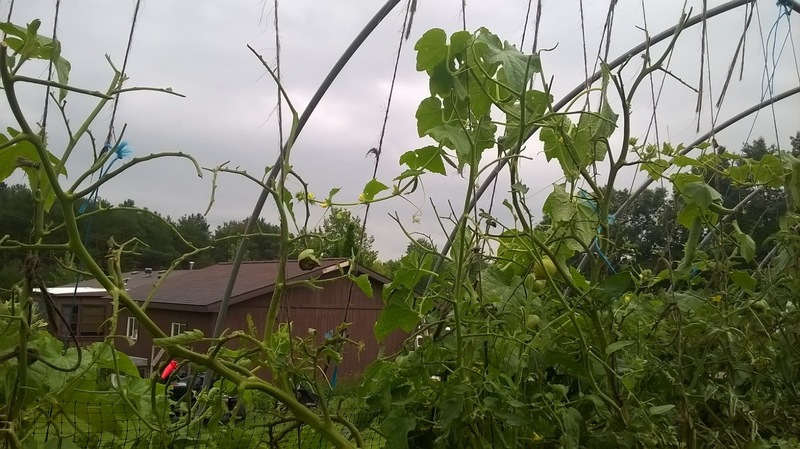 Our tomatoes in the field are starting to turn red, starting with the roma tomatoes and cherry tomatoes, just in time as the greenhouse tomatoes begin to fall under the onslaught of tomato hornworms. Everyone gets an heirloom slicer, red tomatoes, and snacking tomatoes this week. Cubanelle, jalapeño, poblano and bell peppers this week! Enjoy some fresh salsa with this mix of hot and sweet peppers. More green beans this week, and the start of our purple and yellow beans! 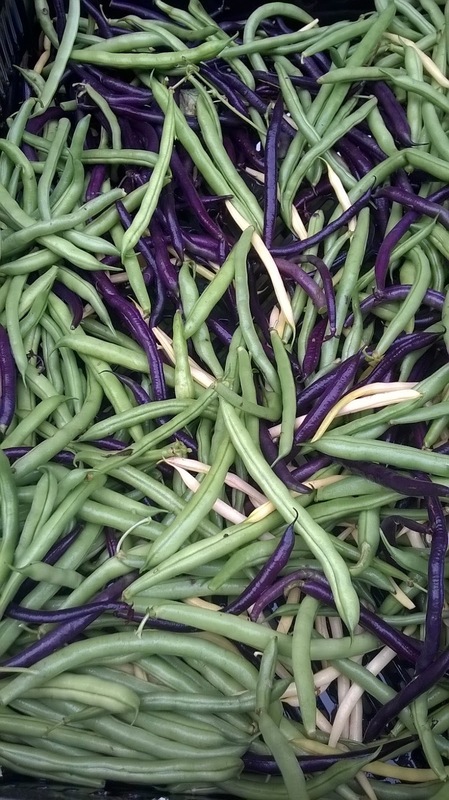 The yellow beans are yellow throughout, and will keep their color when cooked, the purple beans however are only purple on the exterior and will change to green when cooked. For herbs this week we have Italian Basil, catnip and onion chives. Italian basil goes well with tomatoes, summer squash, cubanelle peppers, chicken, beef, and fish. Try it in caprese salad or the mothership tomato salad! This is an heirloom variety called Lettuce Leaf because its leaves are that large. Onion Chives have a mild onion flavor and pair well with potatoes, chicken, fish, eggs, in dips, soups, sauces, risottos and rice. We finally got some decent rains this week, the winds were strong though and have bent over some of our sweet corn unfortunately. 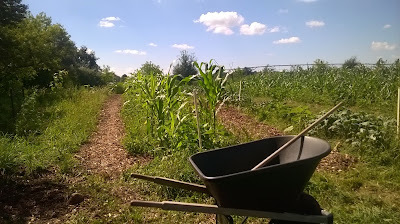 The major doings on the farm right now are garden related mostly, fighting back the weeds, mowing the aisles and trying to mulch over them to prevent regrowth. 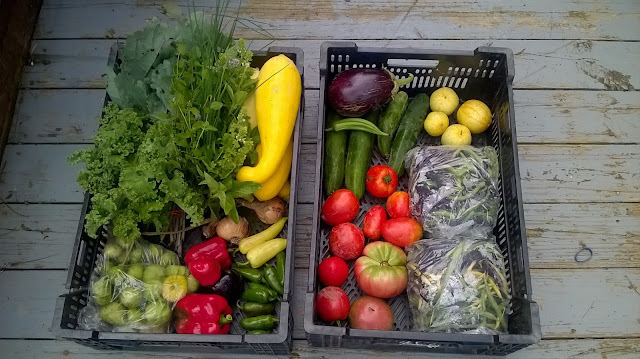 We have a return of some crops this week, broccoli and eggplant, and some roots for our Large Shares. 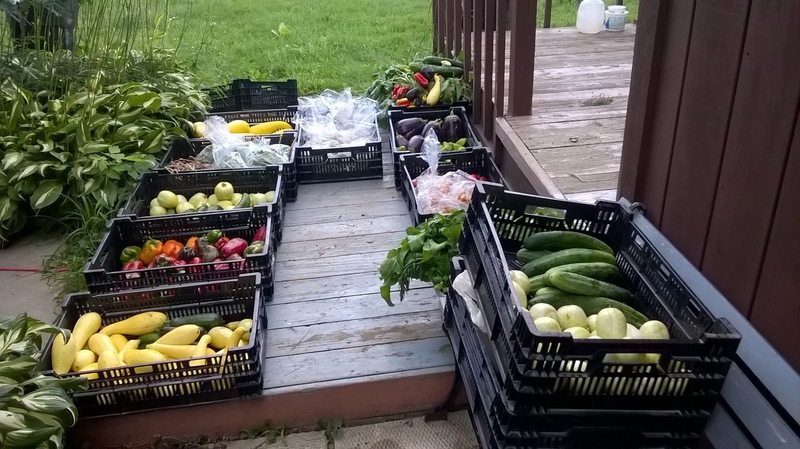 Lots of summer squash and bell peppers this week, so if you don't think you can keep up, preserve them for winter! 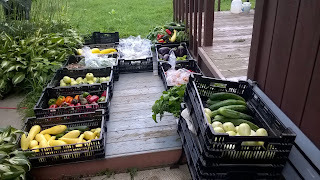 Large Share pictured: 8 summer squash, 4 long cucumbers, 4 lemon cucumbers, 2 large slicer tomatoes, 4 small tomatoes, 1 lb cherry tomatoes, 2 lbs green beans, 14 jalapeños, 10 bell peppers, 2 root bundles, 2 eggplant, 4 cubannelle peppers, 2 bags of broccoli, 2 bags of tomatillos, 1 lb ground cherries, 2 banana peppers, 2 purple onions, 2 root bundles, 2 bundles herbs. Small Share pictured: 2 lemon cucumbers, 2 long cucumbers, 4 summer squash, 1 large slicer tomato, 2 small slicer tomatoes, .5 lb cherry tomatoes, 5 bell peppers, 2 cubannelle peppers, 1 banana pepper, 7 jalapeño peppers, .5 lb ground cherries, 1 bag tomatilllos, 1 eggplant, 1 purple onion,1 bag broccoli, 2 bundle herbs. Our later root crop plantings didn't do well with the heat and lack of water, so we only have enough root crops to share with the Large Shares. They get radishes and beets this week! New for this week are eggplant! Not everyone's favorite, we don't have quite enough for everyone this week, so please only take one if you want one! Also known as aubergine, brinjal or garden egg, the fruit is widely used in cooking and is related to both the tomato and potato. The raw fruit can have a somewhat bitter taste, but become tender when cooked and develops a rich, complex flavor. The great is capable of absorbing large amounts of cooking fats and sauces, making for very rich dishes. Try is roasted, skinned, mashed, mixed with onions, tomatoes and spices and then slow cooked. It is often stewed, as in the French ratatouille or deep fried for eggplant parmesan. A simple way to try it is sliced and grilled with cumin, salt and pepper seasoning. A reappearance of broccoli this week for everyone. These are smaller heads and offshoots, but just as good to add to a stir fry, salad, or quiche! More ground cherries this week, about a half pound for small shares, and a pound for large shares. This strange golden berry is related to the tomato plant, and is indigenous to the new world. It has a similar texture to the tomato, but in flavor is more like strawberry or pineapple. The fruit are rich in cryptoxanthin, and contain pectin and can be used in pie filling. They can be eaten raw and used in salads, you can add them to dessert, use as flavoring, make into fruit preserves, or dry and use like raisins. New this week are lemon cucumbers! Resembling a lemon, these cucumbers originated in the Middle East and have a mild pleasant taste complemented by a cool, crisp texture. The flavor is more delicately sweet and less acidic than the common green cucumber. The time bristles are edible but may be easily removed. These are dual purpose cucumbers, great for enjoying fresh or pickling. Try adding them to a sandwich, wrap, or pasta salad or making a cucumber salad. Our tomatoes in the field are starting to turn red, starting with the roma tomatoes. We've also been seeing the distinctive trail of the tomato hornworm and crushing them wherever we find them. 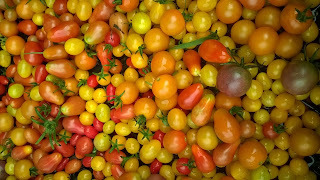 Many of the tomatoes in the greenhouse split under the high heat of the plastic, but we can still enjoy some Brandywine slicers,Kellogg's Breakfast and Black Krim heirloom slicers and this week some yellow cherry tomatoes! Cubanelle, jalapeño, some banana peppers and lots of bell peppers this week! Cubanelle pepepers have sweet, mild flesh with rich flavor great for cooking and frying. It is thinner-walled, best suited for quick cooking. Popular in spanish, italian and slavic dishes, many cooks prefer it to bell types. Banana peppers are not very hot and are great in proscuitto and cheese or in a sandwich. Try these sautéed or grilled with our carbonara recipe! The larger zucchini are great shredded and then made into muffins or bread. 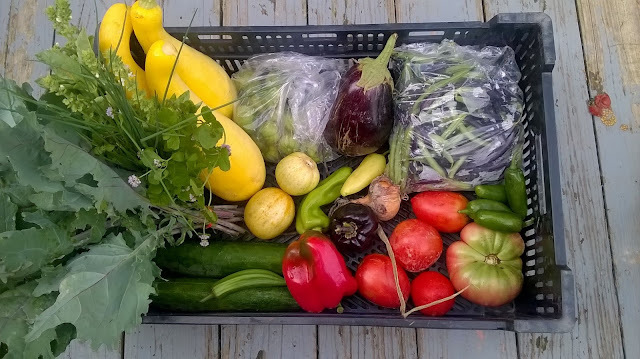 Lots of squash this week, so consider saving some for winter! You can easily quick blanche and cool and then freeze them to enjoy later. 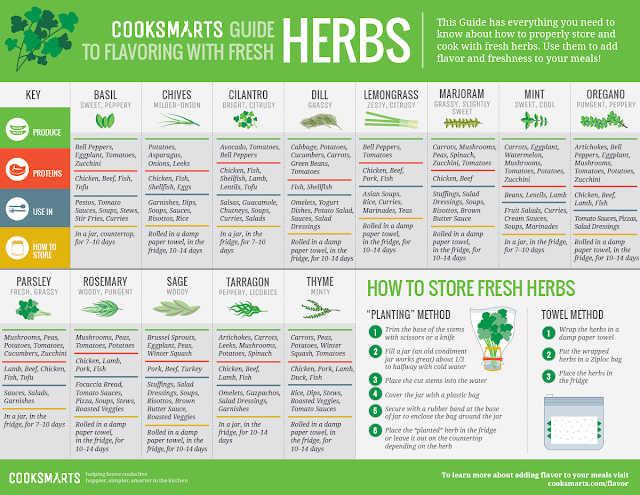 For herbs this week we have Italian Basil, lime basil, and tarragon. 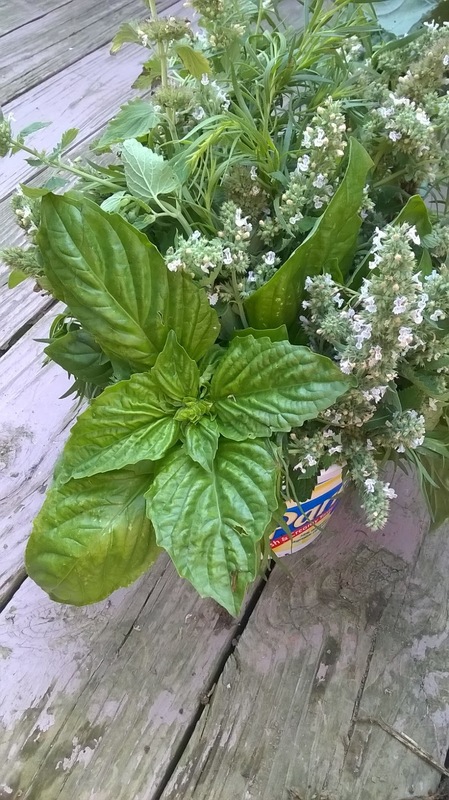 Italian basil goes well with tomatoes, summer squash, cubanelle peppers, chicken, beef, and fish. Try it in caprese salad or the mothership tomato salad! This is an heirloom variety called Lettuce Leaf because its leaves are that large. Tarragon hs a perppery, licorice smell and goes well with root and leaf crops, chicken, beef, lamb , eggs and fish. Try it in a salad dressing or omelet! Tarragon leaves can be frozen or dried. 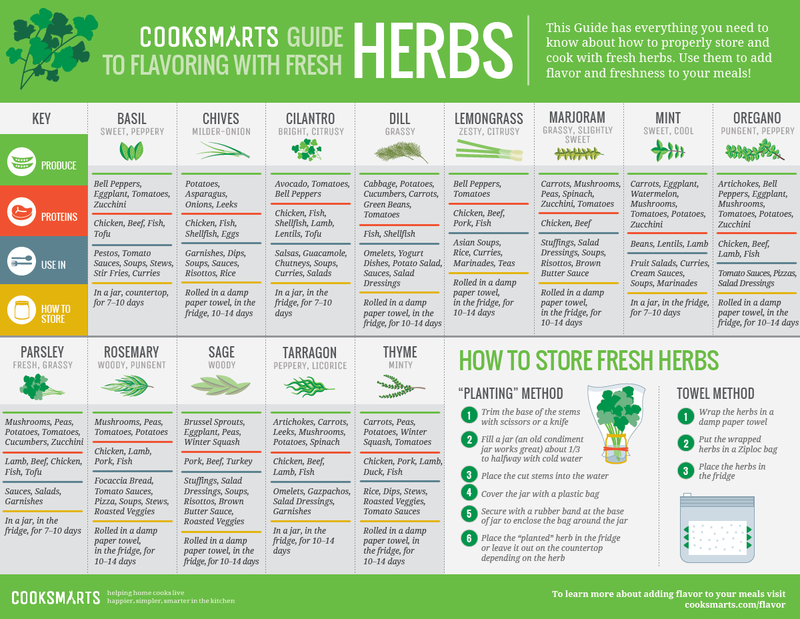 If left to dry for too long though, the leaves lose their flavor, so make sure to store them in airtight containers as soon as the leaves are dry.